Together we can uphold the dignity of disadvantaged women by giving them free access to safe feminine hygiene: 100% certified organic cotton tampons. It all started at a local food bank when our founders were moved to tears by a young woman’s simple request: a tampon. We also partner with Days for Girls, an international not for profit organization providing a more dignified, sustainable and humane world for girls around the world through advocacy, reproductive health awareness, education and sustainable feminine hygiene. We support their efforts with donations to refugee populations in Greece and Turkey. Help us uphold the dignity of all women by providing free access to safe feminine hygiene! Organic cotton tampons are 100% certified organic, and are better for a woman’s body than traditional tampons. 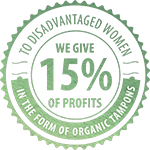 Organic tampons are free from dangerous chemicals, toxins pesticides, fragrances, and synthetic fibres that increase a woman’s risk of TSS and vulvitis. And organic cotton tampons are eco-friendly. Together we can alleviate poverty by providing access to 100% organic cotton tampons to disadvantaged women. Right then and there, Antipoverty Brands was born. We began with a mission: develop a 100% organic cotton tampon for women in the UK, and for every purchase made, send a product of equal value to women in need. Our vision is to donate to your food bank every time a customer purchases our 100% organic cotton tampons. We’ll match each purchase, and even cover the costs of delivery to your food bank. We’re building partnerships with food banks across the UK. Our partners ensure 100% organic cotton tampons end up in the hands of those in need. Please reach out if you are interested in joining our cause: improved health, environmental responsibility, and social good. We’ll match every sale of 100% organic cotton tampons by sending a product of equal value to your food bank. If you are not affiliated with a food bank, but work with disadvantaged women, give us a call. We’d love to work with you, too!